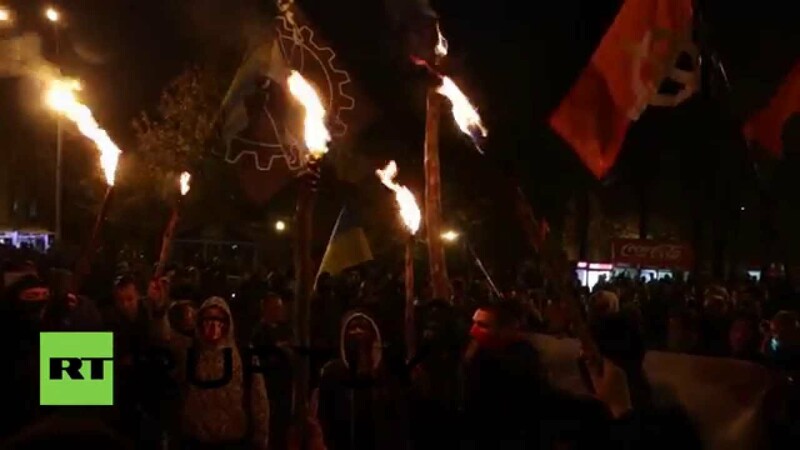 On October 14 thousands marched in several Ukrainian cities to mark the anniversary of the founding of the Ukrainian Insurgent Army (UPA), the WWII organisation which collaborated with Nazi Germany and carried out genocide against Poles and Jews. President Poroshenko declared the day a national holiday. During the day there were several marches in Kyiv. One of them was organised by far right party Svoboda, which has three ministers in the current government of PM Yatseniuk. The march was held under the demand to “ban Communist ideology and its organisations” as well as to “recognise the UPA as fighters for Ukrainian freedom”. 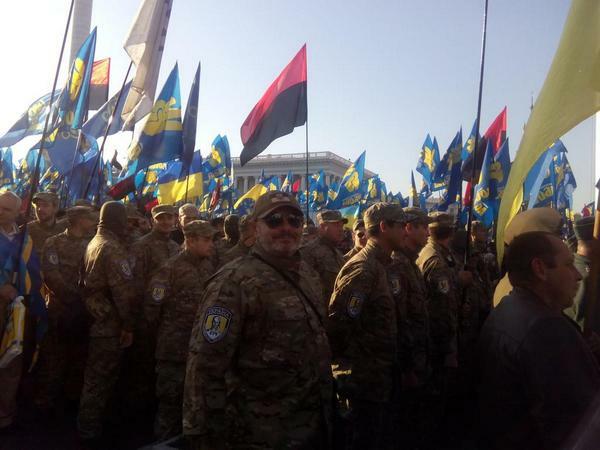 At the head of the march were members of the party’s volunteer battalion in their military uniforms. According to a report in Timer, the party MP Irina Fahrion in which she railed against Putin saying: “We will never change this aggressor, except that we have only one way – to destroy Moscow.” She also quoted Hitler saying: “Hitler was right when he said that wars are won before the outbreak of hostilities, wars are won when the teacher will suffer defeat and when the priest will suffer defeat.” A video of her speech is available on-line. Meanwhile, Svoboda had moved a motion for the Rada (Parliament) to discuss a “Law on recognition of Ukrainian Nationalists and the Ukrainian Insurgent Army belligerent in World War II for the freedom and independence of Ukraine (№2111a)”. The proposal to include it on the agenda was put to the vote 7 times getting a high of 220 votes, but failed to get the necessary required votes (226) as a large number of MPs were absent (only 13 voted against) (official record of the vote: http://w1.c1.rada.gov.ua/pls/radan_gs09/ns_golos?g_id=6642). It is worth noting that the following parties voted in favour en masse: UDAR (the party of Kyiv’s Mayor Klitschko and electoral ally of president Poroshenko), Tymoshenko’s Fatherland party, the far right Svoboda, as well as the smalled “European sovereign Ukraine”. Clearly all the parties in the current government were in favour of the proposal, including the Rada speaker Turchynov. As a matter of fact, separately from this proposal, president Poroshenko, decided to declare October 14 as a national holiday to mark the “heroes of the struggle for Ukrainian independence.” On September 26, Poroshenko had already said tweeted: “UPA soldiers – an example of heroism and patriotism to Ukraine,” and stated his aim to give UPA veterans legal recognition. During the discussion of the proposal in Parliament, hundreds of masked and armed fascists carrying Svoboda, Right Sector and other flags, gathered outside, presumably in order to “encourage” the parlamentarians. Unhappy with the failure to get the motion discussed they clash with the police, using flares, stunt grenades, metal bars and chains, etc. There were several injured as a result of the violent clashes. Despite the fact that many of those present were carrying Svoboda flags and that the party’s twitter account had been boasting about it, later on in the day representatives of Svoboda, the Azov regiment and Turchynov himself, all disassociated themselves from the violence, which they put down to a “provocation of the Russian secret service”!. There was also a separate demonstration called by even more far right elements in the Azov Regiment, led by the neo-nazi Social Nationalist Assembly, and the fascist Right Sector. They were also marching in military formation, with military uniforms and carrying torches. There were also “marches for the heroes” in other cities, including Lviv, Ivano-Frankivsk, Odessa, Kharkiv and even a small one in Kramatorsk, Donetsk. This entry was posted in News and tagged azov, genocide, Irina Fahrion, Poroshenko, Svoboda, Turchynov, UPA. Bookmark the permalink. As like in “there are no pigs in the Netherlands”.